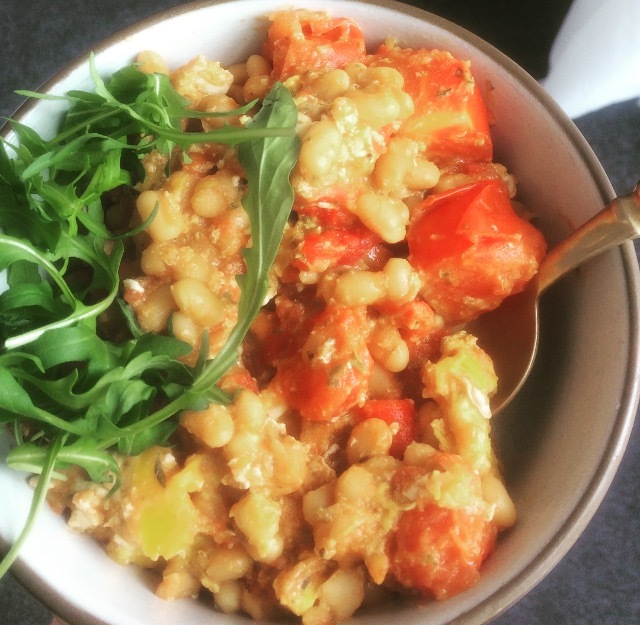 Pulses are high in protein and fibre, a fab combo for keeping you feel full and satisfied. Tomatoes are packed with nutrients including vitamin A & C. Eggs are also a fantastic source of nutrients including protein, omega 3 and vitamin b12. If you can afford it, try to buy organic free range. We are what we eat, and the eggs we eat are made from what are feathered friends eat. A chicken that has been fed on a diet high in GM corn and hormones in a cage will lay eggs lower in nutrition than those free to roam , act like actual chickens and eat a natural diet of fresh grass and organic grains. This recipe is has a real 'anything goes' kinda vibe to it. So if you have red onion and garlic , then by jingo whack them in! The possibilities are endless but sadly my budget is not, so see below my recipe for a broke yet wholesome breakfast. ensure all of the egg bits are cooked. Serves hot in a bowl with a slice of buttered rye toast.